This peak is #7 on the Height List for Colorado . 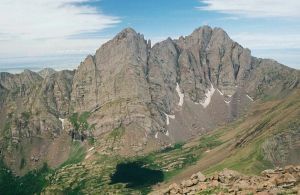 This peak is #5 in Prominence List for Colorado .Crestone Peak is one of the more challenging of Colorado's 14,000 footers. It's located in the Sangre de Cristo Mountains in south-central Colorado. The standard summit route is via a couloir on the south flank and then a rock scramble along the southeast ridge.